Crux, a boutique brand based in Minnesota, continues to bring new cigars to retailers’ shelves. Guild, announced a while back, is among the latest. And among the best. 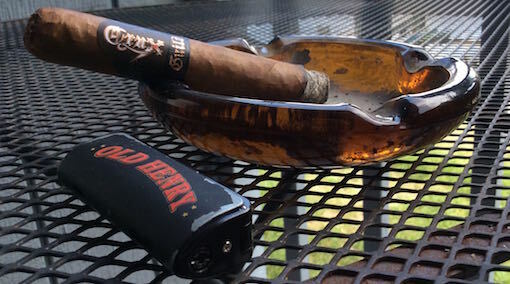 It is a full-bodied cigar with a lot of flavor and an opening punch that reminded me of Don José “Pepin” Garcia’s early releases in that it instantly grabs your attention with a spicy start that doesn’t let go. The blend features an oily Ecuadorian Habano wrapper that gives off a pre-light barnyard aroma. The binder is Nicaraguan, as are the filler leaves, though Crux offers no further information about their makeup. Like other Crux productions, these are rolled by Plasencia. All five vitolas come in 20-count boxes with the cigars in four individual five-packs. The 5.25-inch robusto extra, which I smoked courtesy of Crux, is, at 54, the largest ring gauge of the bunch. Each of the sticks I sampled had a near-perfect burn, excellent draw and lots of smoke production. The Robusto Extra costs $9.50. This is a balanced and complex smoke that presents a variety of flavors and textures. After the spicy start dials back a bit, a nuttiness comes to the fore. That’s followed by rich cedar and a bit of tea. Other flavors I found included cinnamon, leather, and a sweet tobacco taste. Crux co-owner Jeff Haugen is serious about the cigar business, which he’s also involved in as a store owner. When I spoke with him after the U.S. Food and Drug Administration rules came down in May, he was adamant that Crux would continue as a viable company. He was equally resolute in his determination that Crux will release cigars when they are ready, not according to a timetable dictated by the FDA. In this case, the wait for Guild was worthwhile. I give this cigar four stogies out of five.